A friend of mine shared this bread recipe with me several months ago. I could kick myself for having just now gotten around to using it. The recipe is from Mother Earth News and can be found here. It is by far the easiest bread I have ever made. You spend a few minutes making the dough (without kneading!) and after letting it sit for a couple of hours, you can use it. The recipe makes a large amount, so you refrigerate the portion you do not use right away. 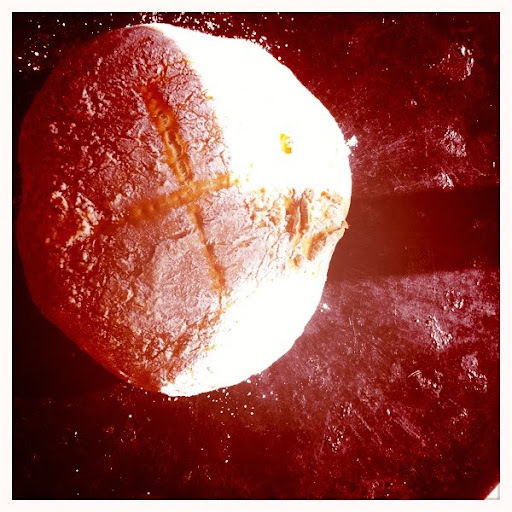 When you want bread, you just cut off a hunk of dough and quickly shape it (without kneading!) and after it rests for a little while, you toss it in the oven. You can make several different breads from the recipe, including pizza crust and naan. And it is so simple! Michael says it is the best bread I have ever made. And seriously, after the few minutes mixing on the first day, I love that I can bake a loaf of bread every day with hardly any preparation! What's not to love about that? Get their book!!! It will revolutionize your kitchen life, no exaggeration. The regular recipe is divine, as you mentioned. Make their brioche and you'll want to pass out it's so good. BTW - the pizza crust and pitas from this recipe are ah. may. zing. I recently got the book and have some dough in the fridge. I like just being able to make some everyday or every other. Thank you for sharing, I have my second batch fresh in the fridge .... and I'll bake myself a little for my afternoon nutella sandwich!